The Happy Day Project: Day one. How excited are you to start spreading sunshine? Today we are focusing close to home. Whether you know them, or just would like to know them, know that they will be surprised and delighted by a thoughtful treat. Who has time for fancy? It could be a little stack of Pillsbury break and bake cookies, stacked in a jar, finished off with a cute tag. Preferably delivered by a trio of girls in their pajamas. Did I have dreams of making my favorite pumpkin bread? Plans to deliver it during the daylight hours? Did I find myself lacking both the pumpkin and the daylight? Maybe. Because sometimes plans don't always go the way you think that they will. You know what? My plans don't matter. My neighbor matters. The darling neighbor, who fetches our mail while we are away, who dotes on my littles like they were her own grandchildren, was happily surprised when those same littles, came smiling and bearing cookies to her doorstep tonight. Perhaps she is sitting down under a cozy blanket right now with a glass of milk and her jar of cookies. Warmly knowing that we care about and appreciate her. Who needs a treat in your neighborhood today? Mique of 30Days made this lovely tag, reminding us to delight in the little things. Isn't it the little things that often get overlooked? Isn't it the little things that when noticed can really get us through the big things? Today I will choose to delight in them. Mique's dear friend Sharlie delights in them daily as she fights a hard fight. We wanted to highlight and support Sharlie's Angels as they help raise money for this wife and mama who is awaiting a heart and double lung transplant. You can learn about sweet Sharlie here. Donate directly to her fund here. May your find delight as you bless a neighbor today. May you send love by donating to Sharlie's Angels or by shopping for Sharlie. Im so excited to get started! Would it be possible to get all the printables now? We don't have a printer at home and my husband will be traveling so I can't have him print them at work each day. Thanks!!! I love this. What an amazing idea. I just made my neighbors cheesecake filled pumpkin muffins last week--I think we'll be doing another little goody for them today. It's going to be so fun to see how the Lord works through this protject! We've had a hard time connecting with our next door neighbors since we moved in...3 1/2 years ago! I've often thought of taking them a little something to break the ice and just never have. Today's the day! Such a fun idea! Love it and the printable! making pumpkin bread. TJ's boxed. couldn't be easier. thanks pal. Love this idea - I helped the special Education Teacher at my son's school today - she saw what I was/have been doing for his class & really wanted the all the same games for her room but has no parent helper - So I offered to do the project for her. The tears in her eyes - made my day - she said no one has ever offerd to help her. love it! pumpkin muffins are in the oven right now! thank you! i had different plans than actually happened, too. it didn't matter at all, you're right! this is so AWESOME. love ya! I'm back to college for the umteenth time and I'm bringing my teacher some dry erase markers. As a teacher working towards a special ed credential, I know how teachers always need more markers! Thanks for getting us started on sharing so much happiness. thank you for bringing sunshine into my world. your posts always lift my spirit and I enjoy your perspective on things! we are baking our cookies as I type to deliver to new neighbors!! thank you! 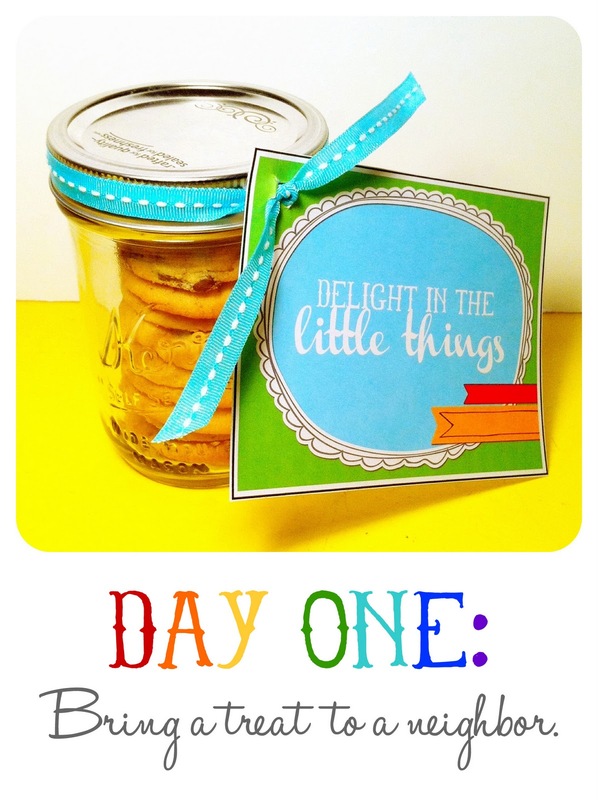 what a great idea and adorable printable! Very excited! Thanks for the wonderful idea! Love to get my give on! I am so happy I came across your blog - what a fantastic idea!!! thank you again for these ideas to get us rolling. Thank you for being an inspiration and encouraging us to look outside ourselves in such creative little ways. I love the additional opportunity to support different charities that we otherwise wouldn't have known about. I'm working on getting a giveaway together to encourage people to give! I think it would be awesome to build a well this Christmas and make a difference in the lives of a community! Thanks for your consideration and help! :) Love The Happy Day Project! Julie, you make my day happy. Sent my hubby and son off to our next door neighbors w/blueberry muffins and a note my son wanted to make them while I finished off dinner...we made it a whole family thing! :) It was a happy day indeed! Thanks! I am of course a day late.... but I am on board. I love this project! 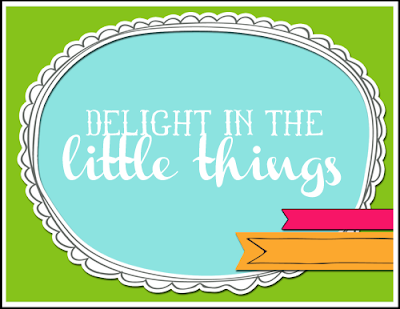 I printed out my "delight in the little things" cards and can't wait to bake tomorrow and surprise a few people. Such a lovely idea! I didnt get any pictures to post to my blog but i did get to bless my neighbor. Her grand daughter lives with her and is always comig by to say hello. I decided to make her a couple of cute headbands and some cookies. When we delivered them she was super excited. We invited them to church too! What a great idea! Just found you through a friend's blog. We are joining in too. :) Already making cookies for a teacher's luncheon tomorrow and took cookies to a neighbor last week - so we aren't too far behind! Again, awesome idea!